The SOLO Temperature Controller is a single loop dual output process temperature controller that can control both heating and cooling simultaneously. It is available in 1/32, 1/16, 1/8 and 1/4 DIN panel sizes and is UL, CUL and CE approved. I stands for integral and accounts for past values of the error – It uses math to basically find the approximation of area under the curve. D stands for derivative and accounts for possible future values of the error, based upon rate of change – It uses math to determine the slop of the error over time and multiply this by the derivative gain. AT – Auto Tuning as the name implies will automatically cycle your control system through two cycles and set the PID parameters. On/Off control is the simplest form of control. In the case of temperature the output will be on when the temperature is below set point. When the temperature gets above the set point of the controller the output will be off. When this cycling occurs frequently, you can add a hysteresis to the output. This will limit the time the output goes on and off by a number of degrees. Manual mode is when you need to control the output directly. By entering manual mode the operator can adjust the values of the output(s). The Ramp / Soak control mode is used to control the outputs according to the pre-programmed SP patterns with the PID control method. The Solo can have eight programs with eight steps each. 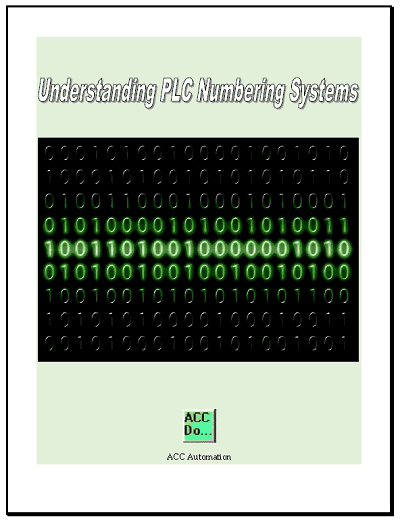 Note: This can be increased with the additional use of hardware and software via HMI or PLC. 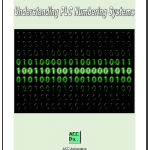 The available outputs include relay, voltage pulse, current, and linear voltage. There are up to three alarm outputs available to allow seventeen alarm types in the initial setting mode. SOLO can accept various types of thermocouple, RTD, or analog input. This means that cascade control is possible with these controllers. When you use the output of one of the Solo process controllers as the input to another, this would be cascade control. It has a built in RS-485 interface using Modbus slave (ASCII or RTU) communication protocol. 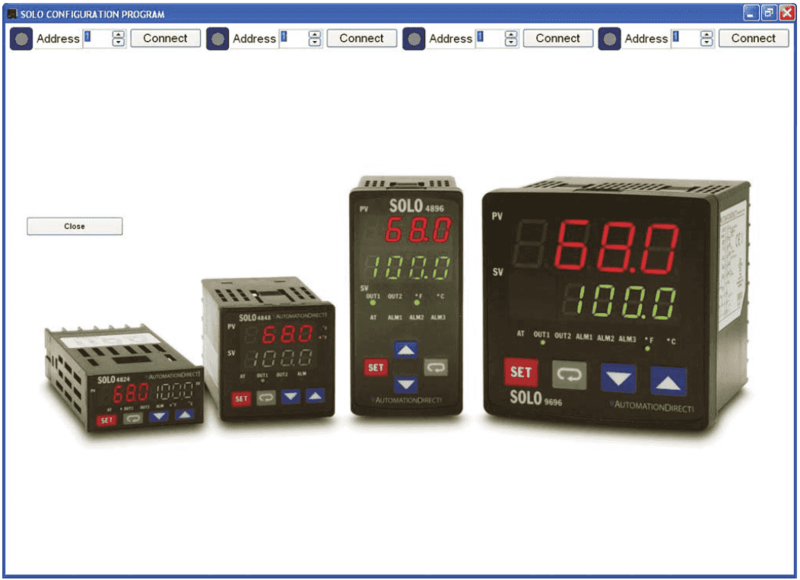 The Solo Process Temperature Controller can be configured through the buttons on the front of the unit or by the configuration software. Monitoring of up to four controllers at once can be done thought the same configuration software. The configuration and monitoring software does not have to be installed. You just need to download the file “slsoft.zip”. 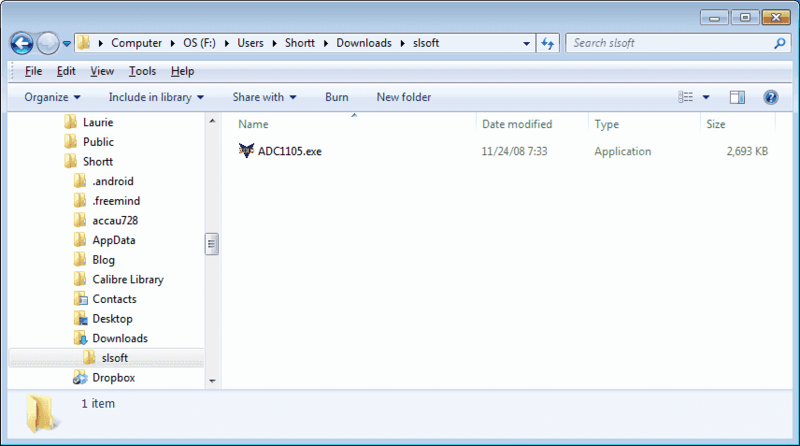 Once downloaded right click on the file and select “Extract All…”. The file ADC1105.exe can now be run. The recommended screen resolution is 1024 x 768. 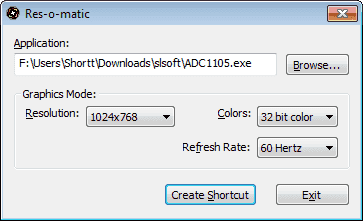 If you do not have this resolution then there is another program that will allow us to create a shortcut to this program and change our default resolution. After we exit the program, our screen resolution will return to its original state. 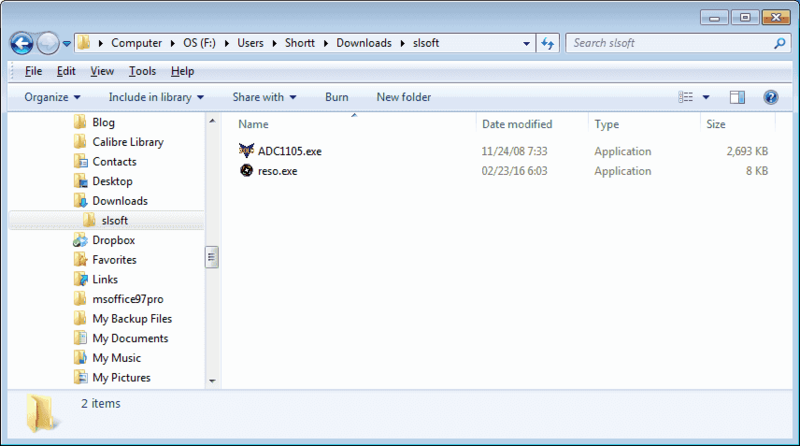 Click on the reso.exe file in the folder to run the application. 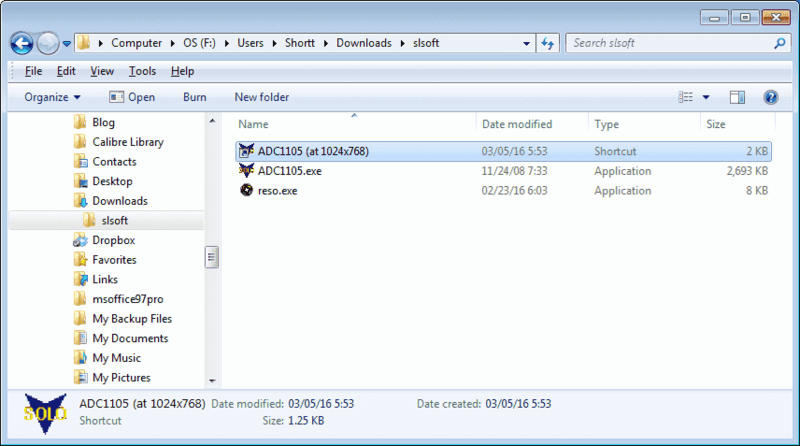 Click the Browse… button and select the ADC1105.exe solo configuration software. We can leave the rest to the defaults as shown below. 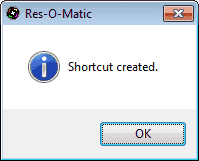 Now Click Create Shortcut. Put the shortcut in the same directory as the software that was downloaded. We will receive notification that the shortcut was created. Click OK.
Our folder will now look like this. Click on our shortcut (ADC1105 (at 1024×768)) to start the Automation Direct Solo Series Configuration Software. There are six icons on the main menu. Follow these in order from left to right to setup or troubleshoot your system. Under the Com port setup we configure the serial port of the computer to communicate to the Solo. 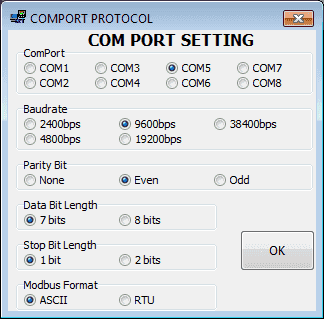 In our case we will use COM5, 9600, Even, 7 Data Bits, 1 Stop Bit, Modbus ASCII Format. In the Configuration menu we will select the address of the controller that we will be communicating. This will be the default of the Solo which is 1. Selecting Connect will then communicate to the Solo process temperature controller and you will see on the screen a picture of the controller with the PV, SV and indicator lights active. 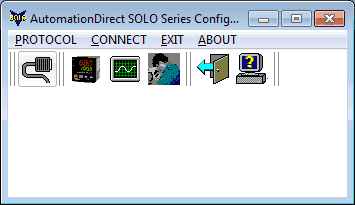 This screen will now allow you to set up all of the parameters in the Solo. Once you enter a value it will be red on the screen. After hitting enter on the keyboard and the value will then be sent to the controller and be displayed in black again. The recorder screen is used to monitor the temperature over time. You can monitor up to ten Solo Controllers at once. 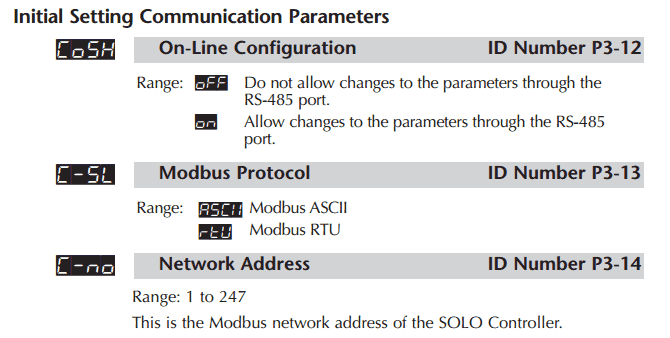 Command Test is used to send individual Modbus command out. 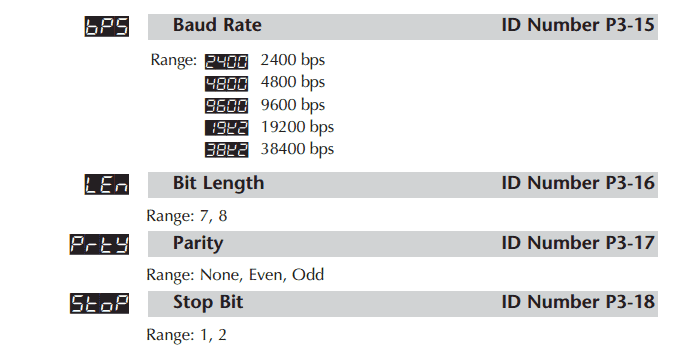 This is done in Hexadecimal. 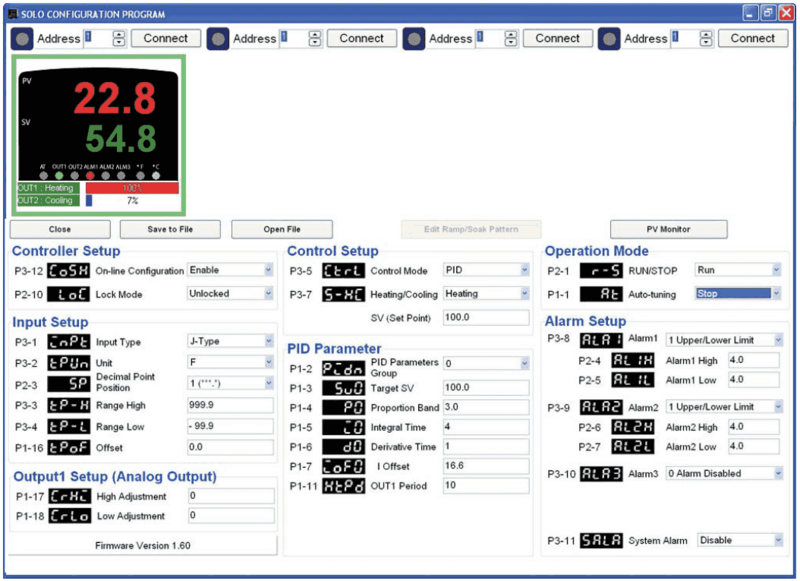 The software for the Solo Process Temperature Controllers is very functional. 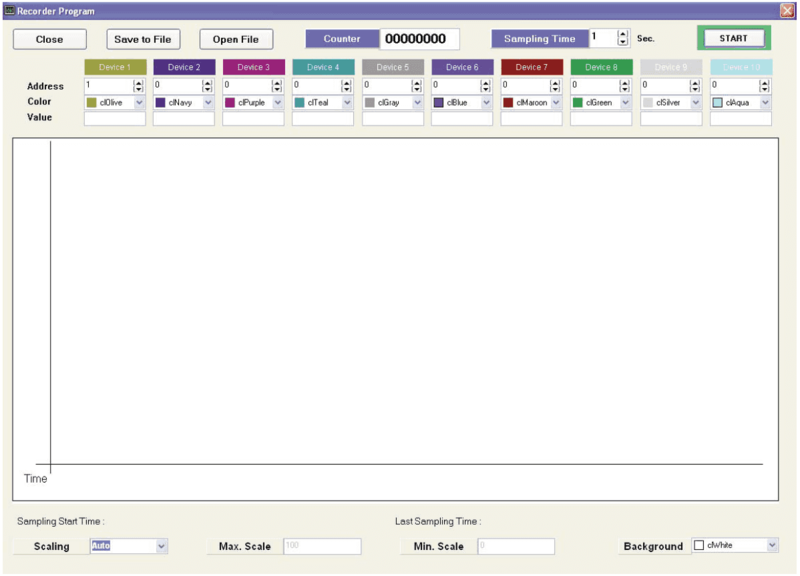 Using the Reso software, you will be able to put the Solo Software in the 1024 x 768 that it was created for without manually changing the screen every time.